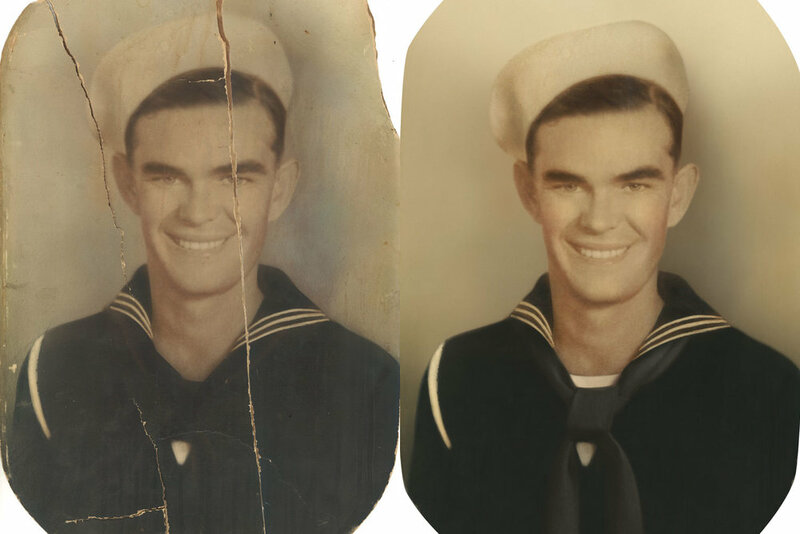 This paper portrait was scanned and digitally repaired, so we could provide a fresh new archival print to our client. We digitally cleaned up this print, so the little girl can pick up her toys. This military certificate was badly acid burned. We were able to brighten the original print and remount on acid free backer board, so this piece is no longer feeling the burn. This lovely little painting on chip board was repaired and framed, to prevent this type of damage from occurring again. This photo from the early 1900s was badly damaged and faded. we were able to scan the original and digitally repaint much of the damage so we could provide a new archival print to our client. This poor child was actually being eaten by termites. We digitally reproduced it and repainted it, and provided archival prints (along with the number of a good exterminator) to our clients. This lovely bride was digitally reproduced and repaired. A fresh new archival print was provided to our client. This Jesus print was digitally resurrected into a bright new archival print. We digitally repaired this piece, and provided an archival print to our client. This newspaper from 1881 was as fragile as tissue paper. We were able to flatten it, reassemble it and laminate it so it could be handled and read for another 150 years. 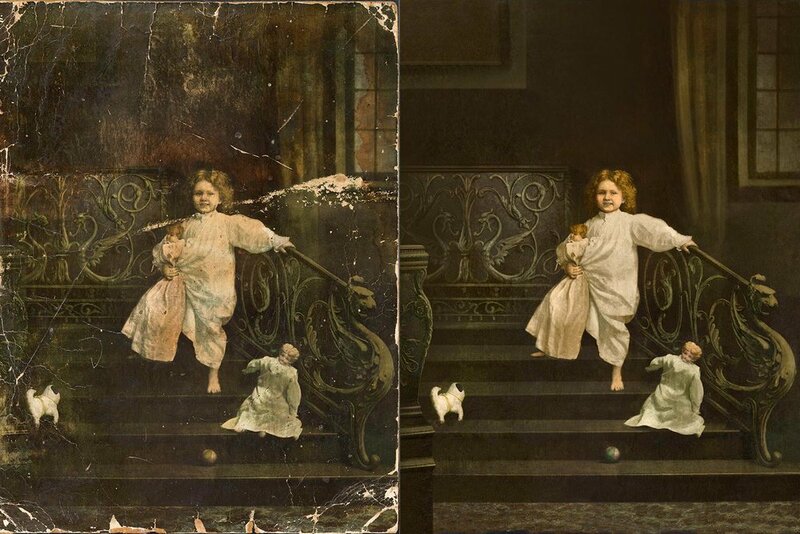 This badly damaged photo was digitally repainted so our clients could enjoy a fresh new archival print. As with all art conservation, restoring works of art on paper involves both art and science. Our expertise includes repair of discoloration due to age or acidic conditions, removal of undulation and stains and the repair of tears. All of these treatments and processes are carried out in compliance with the American Institute for Conservation’s (AIC) Code of Ethics.